Are you an active woman on the go? Do you like to wear no-show socks with your tennies? 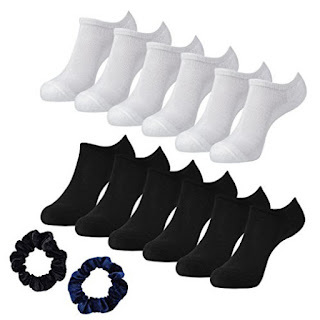 I found a real value in Sockletics Value 12 Pack , it comes with 6 pairs of black, and 6 pairs of white no- show liner socks. They have a thick cushioned sole for extra comfort. These no-show socks are thin liners to help keep your feet comfortable and drier. They are made from 98% Polyester and 2% Nylon, the perfect blend for comfort and dryness. They comfortably fit a women's shoe size 4 1/2 - 10 1/2. As a bonus there are 2 scrunchies included for your active lifestyle. These socks are perfect for walking, running, work outs, work or just leisure. Also they would make a nice gift for an on the go woman. New socks always put a little pep in your step!